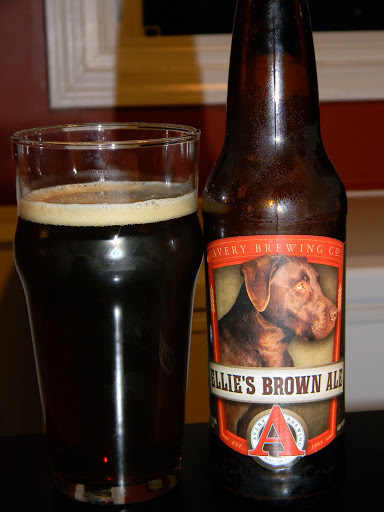 Review of Avery Ellie’s Brown Ale | Beer Apprentice - Craft Beer News, Reviews, Interviews and Info. Tonight’s review focuses on a Brown Ale from the Avery Brewing Company located in Boulder, Colorado. It’s called the Ellie’s Brown Ale. From the website, averybrewing.com, I stumbled upon this implied description. I’m ready. How ’bout you? A 5.5% ABV beer presented in a 12 oz. bottle. It poured a nice, clear ruby/brown color with an off white head that only had average size and average retention. Faint orange highlights hug the bottom of the pint. The head appeared creamy and smooth. Some traces of lace were left on the glass, but nothing overly outstanding. The aroma was a nicely balanced mix of a sweet malty caramel followed by some roasted nutty flavors. Mostly pecan and walnut. The nuttiness was not extremely robust, but plentiful enough to make a nice showing. Touches of chocolate and I even picked up a quiet coffee note. In the very back, I detected some toasty grain and biscuit. It smelled pretty good, I thought. The taste was not quite as complex or balanced as the smell. More straight forward with the roasted, nutty flavors and caramel malt. More of an understated sweetness from the caramel and chocolate. The coffee seemed to become more illusive in the taste. A decent amount of bitterness, but nothing evocative or mind blowing. The flavor, overall, wasn’t bad. Maybe just a bit relaxed. This Avery had a medium mouthfeel. It was smooth, dry and only somewhat creamy. A bit snappy and it covers the palate in just an ok way. This is a pretty good, straight forward Brown Ale. Nothing overcomplicated. Just an easy drink that was enjoyable and would make for an excellent session beer. It’s worth a try if you see it of course, but I wouldn’t make a special trip to pick it up. This beer reminds me of the Fall season, although it could be enjoyed throughout the Winter and on into the early Spring. Thanks again for reading, whomever you are. I hope you are enjoying the reviews. Stay tuned because soon I am going to post a trip to my craft beer liquor store. Cool pictures and good beer. Cheers!! !